If there were any doubts in the wisdom of programming two Mahler symphonies in one evening's concert, these were not borne out by audience attendance at last night's Prom, as Valery Gergiev conducted the World Orchestra for Peace in Mahler's Fourth and Fifth Symphonies in front of a capacity crowd at the Royal Albert Hall. 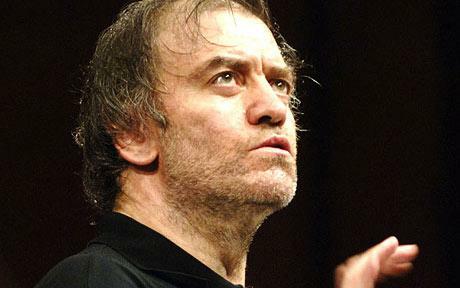 Misgivings about Gergiev's interpretations of Mahler, evident in the mixed reception his 2007-08 season symphony cycle with London Symphony Orchestra received, were largely overcome. Although Gergiev is still some distance from being as consummate a Mahlerian as Abbado or even Bernstein, these performances hinted at a promise that a more mature and thoughtful reading from the maestro is yet to come. Conducting the World Orchestra for Peace, a unique ensemble comprising musicians from the leading orchestras of the world, Gergiev's usual fiery Russian temperament was more subdued, his intent more intellectual and focused than is customary. Around forty countries are represented in the orchestra; players from Berlin and Vienna Phiharmonics, from the Royal Concertgebouw, from London, Chicago and Toronto Symphony Orchestras, Mariinsky, Rotterdam, China, Buenos Aires, Dublin, New York, Budapest, Melbourne and more share the stage without principal positions in a demonstration of an orchestra as an ambassador for peace. Whilst such a diversity of orchestral traditions and culture—not to mention differing views on bowing and articulation and phrasing—should not make sense on paper, the ensemble shared an incredible singularity of expression. The little rehearsal time that such assembled forces are allowed was glimpsed but momentarily - the second movement of the Fourth Symphony was just held together, but this was followed by a radiant third movement. A surprising homogeneity of string sound, underpinned by a gently caressed double bass pizzicato made this sweet Ruhevoll one of the evening's highlights, the end majestic without being bombastic. Often considered the most accessible of his symphonies, the Fourth contains more delicate scoring than one has come to expect from Mahler. The addition of a soprano in the final movement contradicts the otherwise Classical trajectory of the work, sung in this performance by the Swede Camilla Tilling. Tilling's voice has an effortless clarity of tone that matched the refinement of the orchestra as she danced and skipped through the 'The Heavenly Life', but was occasionally in danger of falling foul of the Royal Albert Hall's acoustics, although the final verses, beginning 'Kein Musik ist ja nicht auf Erden, Die unsr'rer verglichen kann warden', provided a wonderful summation. The Fifth Symphony, one of Mahler's most popular works and the beginning of his so-called 'middle period', followed after the interval. Compared to the Fourth, the Fifth Symphony calls for much bigger and brasher scoring, evident from the opening Trauermarsch, but happily lacking in the harsh edge and Shostakovichian severity that crept into Gergiev's Mahler with the LSO. The movement was dominated with thrilling precision by Timur Martynov, principal trumpet at Mariinsky Theatre Orchestra, and just enough storm propelled us to the end of Part One. The famous Adagietto, Mahler's love song to Alma, was treated with care, beginning as if the orchestra breathed a collective sweet sigh, soulful yet not overly sentimental. However, it highlighted the overwhelming feeling that in this concert each movement was a self-contained work. Although executed beautifully, the overarching structure of each symphony, the sense of trajectory, was lost. Indeed, there were moments when the stamina of both orchestra and audience dipped, particularly in the more lengthy dense passages of the first part of the Fifth. However, energised by the high-spirited Rondo-Finale, the audience's five minute ovation begged for more.